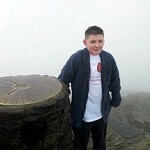 Local lad Jake aged 10 and his Dad Steve hiked 7.5 miles from the base of Snowdon at Pen-y-Pass to the summit and back to raise funds to support the work of the Cardiac Dept. of the Birmingham Children’s Hospital to show their gratitude for the care and support and the ‘miracle’ performed by the Surgeons in giving Karen and Steve the gift of a very special child with a future. This entry was posted in Local Church News, Uncategorized. Bookmark the permalink.